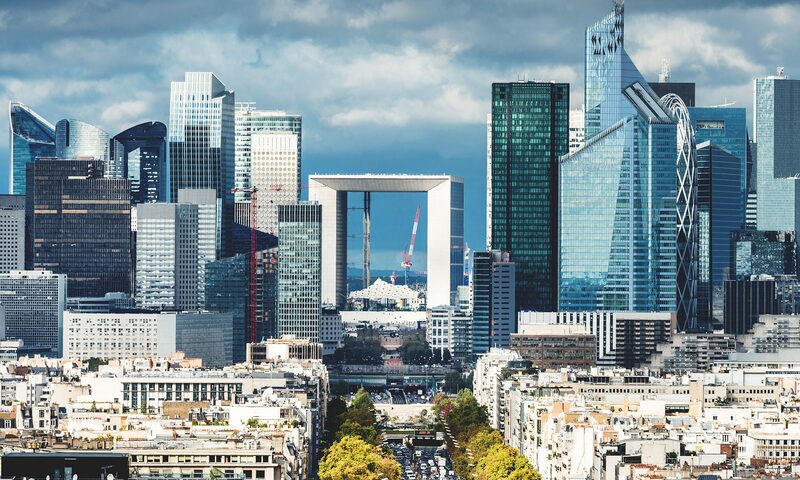 For an avid restaurant hopper, Paris is the place to be for high quality food and diverse experiences. However, this hobby has a way of burning a hole in one’s pocket. But if you dig deep far enough, you will be delighted to find at least one shop that serves a high quality Pakistani dinner for only five euros. The Gare Du Nord area off of the La Chappelle metro stop is known for its South Asian community. 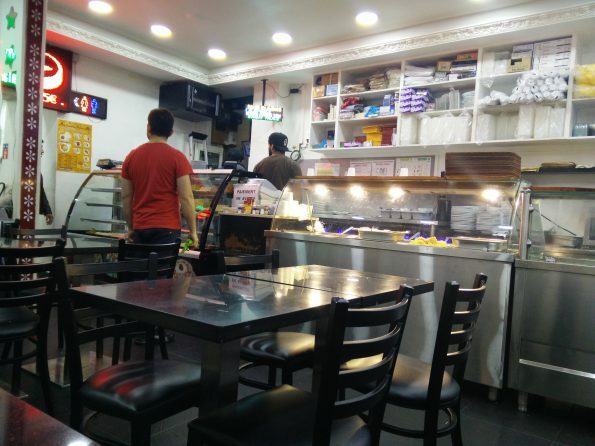 There are many restaurants and shops here owned by Pakistanis, Bengalis, and Indians serving their diaspora communities and bringing their friends food from back home. And among these many shops, a single gem hides from the spotlight, right across the street from the unassuming Bengali tech shop Comptoir Du Bangal. The restaurant’s sign announces itself as the Bombay Palace. And there really isn’t much else outside besides that sign. The words “Indien” and “Pakistanais” are written on the sides, and two bare wooden table sets offer themselves as seating. But there is nothing here to catch the passerby’s eye and lure them in. However, anyone with a keen sense of smell will immediately stop when she gets the first whiff of what’s cooking inside. 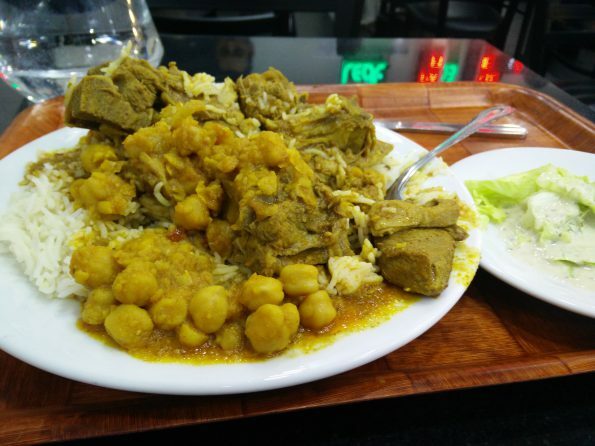 The food in its entirety is on display behind the counter: Chicken biryani, chicken curry, lamb curry, rice, chickpeas, and more. It all looks as if a chef in Pakistan made it just an hour ago and somehow found a way to teleport it to France. And for just five euros, the server will scoop of a heaping plate of rice, a meat curry, and a vegetable selection, and serve it you on a tray complete with a plastic cup for water and a little salad. Clearly, the restaurant chooses not to stand on ceremony. There are no ornate tablecloths, music, or fancy drinks. Those in charge want nothing to distract you from the food, because as soon as you eat it, all the other flourishes cease to matter. Asif, who preferred not to give his last name, is one of the co-owners of the shop. The young man’s two mismatched earrings dangle as he talks. He speaks with a smile and a hushed voice, as if not wanting to disturb the other customers. He explains how the restaurant business has been running in his family for forty years and this particular shop opened 15 years ago. “All kinds come. Indians, Pakistanis, Arabs, French, Tourists,” he says in perfect English, nodding his head towards the room. And indeed the clientele are very diverse. On a normal day’s dinner, you may see a black man in the middle, some Pakistanis and Indians on the sides, and a few ethnic French sitting in the back, all picking at their plates with disposable forks and drinking from plastic cups. There are many similar restaurants in this area, Asif admits. However, he says that this shop is different. “Our food is always fresh. It’s always made fresh. You eat now and come back in an hour and it will be completely new,” he says. A morning customer will find a completely different array of offerings from the night customer, and both will walk away satisfied. Asif smiles; this feature of the restaurant is a point of pride for him. Asif admits that the job gets tough. The hours are long and there isn’t really much money in it. But, nonetheless, it’s the family business and he has the responsibility to keep it alive. Besides, he says, “it pays the rent.” But despite this pragmatic explanation and the noted level of difficulty, Asif’s gaze upon his restaurant betrays something more. He smiles upon his surroundings with a look of compassion for a job that he loves.